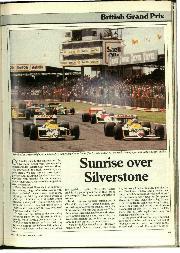 On Sunday July 12 the sun rose over the Silverstone circuit with promise of a remarkable day, even though there were those who murmured "too bright, too early; not a good sign". We had survived two days of practice and qualifying for the Grand Prix, together with practice for the numerous supporting races, and some of the supporting races themselves. 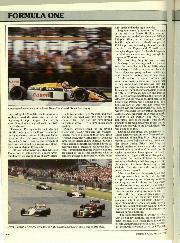 Many hardened Formula One followers reviewed things on Saturday evening with slight disbelief, while casual race-goers, enjoying the drinking and eating which is always part of the festival of the British Grand Prix, had actually taken time off to look at the Formula One cars. They had turned back to their real occupation saying, "My goodness, They do go, don't they? ".